Bird-B-Gone, Inc., offers tips on how to how to determine when and which bird control products are needed. To learn more about humane bird control solutions and Bird-B-Gone’s Authorized Installers, visit us online at http://www.birdbgone.com. All bird problems are not the same. The first step in determining the bird control solution to use is to identify the type of pest bird that is creating a problem. There are products for large birds that aren’t effective for small birds so it’s important to know the type bird you are dealing with. If you treat the area under the wrong assumption, not only will this result in wasted money and man-hours, you will still have the bird problem. It isn’t enough to determine the species of bird; it is also important to know what they are doing. Are they roosting, landing or nesting? Birds landing on a roof are an entirely different problem than birds nesting under eaves. Each situation requires a different approach and possibly different products. Plus one has to take into account the first tip – the type of pest bird. 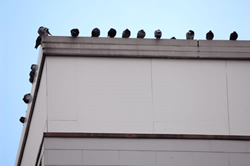 Bird spikes for example would be an appropriate solution for larger birds landing on a roof; however, if the pest birds are small, like sparrows, bird spikes would not be the appropriate solution. Similarly, if birds, no matter their size, are nesting, bird spikes are not the right product. At this point bird netting or another full exclusion product is required to ensure the birds are blocked entirely from the area. Keep in mind there might be several bird species with different behaviors, which will require an integrated bird control solution. Naturally two or three birds is a different concern from a flock of 500 birds. While a small group can cause just as much reason for concern as a larger group, the resolution to the problem might vary. Birds create a nasty mess that is not only hazardous to health but it can create huge financial impacts on a business. Birds can carry any of 60 transmittable diseases that can be easily spread to humans. Bird droppings also create slippery surfaces, setting the stage for a slip and fall incident. Their droppings are acidic and can stain and even ruin certain building materials, translating into poor company image. Each year hundreds of thousands of hard earned company dollars are spent cleaning up the mess left behind by birds. The more birds, the more of a problem; it’s best to control them before the situation is out of control. Using the tips above will help answer questions to determine the appropriate method of bird control to implement. Having a bird control professional analyze the site is the best way to ensure you employ the right solution. Bird-B-Gone works with Authorized Installers all over the U.S. To learn more visit http://www.birdbgone.com or call (800) 392-6915. Bird-B-Gone is the world’s largest manufacturer and distributor of professional bird control products, providing effective and humane solutions to a bird-free environment. Since 1992, Bird-B-Gone products have helped solve pest bird problems in commercial, industrial and residential settings across the globe.